Each Tuesday we feature audio or video of an SR Contributor reading their work. Today we’re proud to feature a podcast by Emilia Phillips. 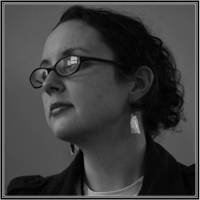 Emilia Phillips is the author of Signaletics (University of Akron Press, 2013) and two chapbooks including Bestiary of Gall (Sundress Publications, 2013). She has held fellowships from U.S. Poets in Mexico and Vermont Studio Center and received the 2012 Poetry Prize from The Journal and Second Place in Narrative’s 2012 30 Below Contest. Her poetry appears in AGNI, Hayden’s Ferry Review, The Kenyon Review, The Paris-American, and elsewhere. She is an adjunct instructor of creative writing at Virginia Commonwealth University, the associate literary editor of Blackbird, the De Novo Poetry Prize and social media coordinator for C&R Press, and the prose editor for 32 Poems. She lives in Richmond, Virginia. You can read along with her poems in Issue 6 of Superstition Review.